The last two days have been rather exciting. That’s not to say that the first two days of our trip home were boring. They were just fine. We’ve had fun meandering across the north western and north central states. But, really, it was Tuesday night when we took a good look at the map and realized just where we were. 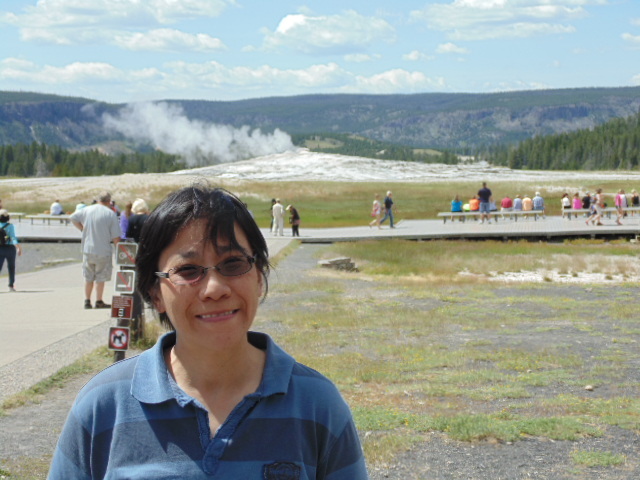 If we just detoured a bit – and took an extra day – we could easily go to Yellowstone National Park. We pondered. We debated. Then we realized that we could do whatever we damn well pleased. So, it was time for a detour! After consulting the maps, we decided the best place to stop would be Bozeman, MT. We’d have to backtrack about 7 miles to get to the turn-off to Yellowstone, but it was worth it to stay in a nicer hotel rather than “Billy Bob’s Motor Inn” in some random town. Though, I think we go the very last room available in the entire town! The county fair was starting the next day and it seemed as though everyone was in town. We got up early to run some errands on the way out of town. I needed an oil change. I had one done just before we left Chicago, but another was necessary – we’ve driven that much. (My regular oil change guy is going to wonder why the sticker on my windshield is from Montana.) After that, I dropped watty off at Staples to get some things and I ran over to the AAA office to get a tour book for Montana and Wyoming. I shall remember from now on to include a stop in every state I’ll be driving through when I request a TripTik – they only give the tour books for places you stop. After that, we got some sandwich making stuff at the store and I bought some sneakers. I didn’t bring any with me since we hadn’t intended on visiting the places we’re visiting. I got a nifty pair, actually. Then, we were on our way!! The drive to Yellowstone was pretty uneventful. But it was really friggin’ beautiful! Since I was driving, I couldn’t do much in the way of taking pictures, I believe watty got some good ones, though. One of the first stops we made was at scenic viewpoint for Madison River. It was so beautiful and peaceful. We continued on along the route toward Old Faithful. On the way, we stopped at Firehole Falls. Again…so beautiful. Still continuing our journey, we paused at a set of smaller geysers – this one was Biscuit Basin.. Since I couldn’t hobble my way to them, watty took our cameras and went to see what she could see. Then, of course, it was on to Old Faithful. Once again, watty did the running to get pictures. But I was able to see it, too. I just didn’t go right up next to it. Fortunately, watty got some of it when it blew. I was able to get a picture of watty – can you believe it? We moved on to West Thumb where there were other small geysers, basically disguising themselves as mud baths. However, jump into this mud bath, and it won’t be very healthy for your complexion. The next stop on the route was Canyon Village. On our way, we saw some bison. They were pretty far away. I had to use the zoom. A bit further on, we saw some more bison. These guys were at quite a distance too. The one who is on the ground was rolling around in the dirt. We made a quick detour up to Artist Point where watty went running to see if there was anything fascinating and worth me making the trek. She said it was quite a distance, so she took some pictures with my camera for me. It was getting late in the afternoon, and I really didn’t want to be driving around the park after the sun went down, so we decided to make our way to the northeast entrance. There was a traffic jam up ahead. A big one. We even saw the lights from the ranger’s car flashing. “Uh oh!” As we got closer, we could see the reason. Bison everywhere! People were stopping to take pictures and the ranger was doing his best to direct traffic. He had his work cut out for him – bison don’t take direction well. Yes, that’s right. The bison were very close to the road. I mean, VERY close to the road. I got some good pictures. I took many at regular camera settings for perspective, then made good use of the zoom lens. As we were moving on (the ranger was trying to keep things moving), one bison let us know that he had other ideas. We had to stop yet again so that Mr. Bison could saunter across the road. Right. In. Front. Of. My. Car. Watty even got some video! What an experience! Our day was made. It was time to head out. At that point, the day became much less fun. The roads were narrow and dangerous. We were going through some mountains. To the left was oncoming traffic. To the right were shear cliffs with drops that would have surely killed anyone who was unfortunate enough to go off the road. No shoulder. No guard rails. It was horrible. The speed limit would drop to 35 miles an hour for the winding roads and sharp curves. That was still too fast! I was going 20! The oncoming RVs were barrelling at me so fast. It was really frightening. Fortunately, there were lots of turn outs (small areas to pull over) so I could let people pass me. Crazy drivers! We finally came to Tower Junction. I had to pull over to pry my fingers off the steering wheel and restart my breathing. After a few minutes, we continued. Another small traffic jam came up after we left the mountains. People were out of their cars and pointing at something in the meadow. 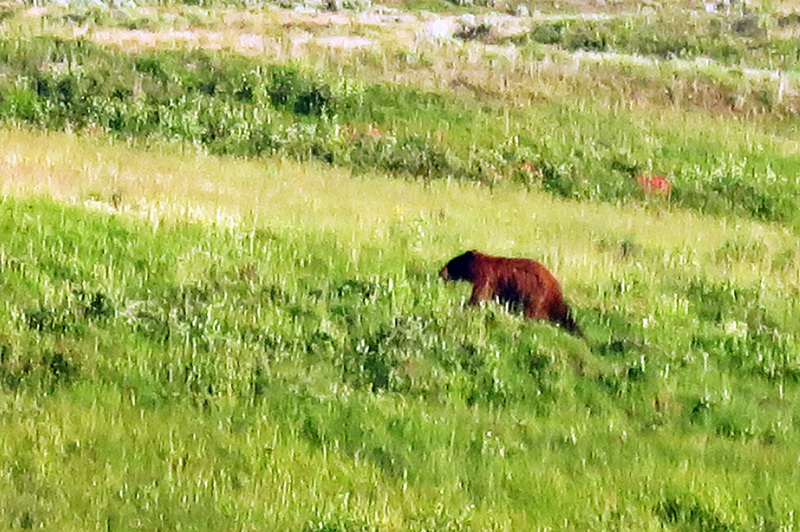 We slowed down and looked – a bear! Watty was quick to snap a photo. Wow! We were wondering if we would see a bear! And we did! We thought we’d seen everything. We were wrong. A bit later, we came up to yet another traffic jam…a big one! Well, up ahead was another small heard of bison. Right on the edge of the road! In fact, one was IN the road. He moved off to the side again, and traffic slowly began to move. BUT…as we were driving up, he got in the road again. Suddenly, I was playing chicken with a bison in Yellowstone National Park!! After that, we started to high-tail it out of there and head to Cody, WY where we wanted to spend the night. Very dark, winding roads made for a harrowing drive. Unfortunately, when we go to Cody, there was no room at the inn. Any of them. Every damned hotel, motel, and lodge in the city was booked. It was either sleep in the car or keep driving. Well, we decided to keep driving. Once again, the roads were pitch black. But we kept going. Watty was a real sport and stayed awake to keep me company. We passed small town after smaller town, heading east on our quest to find a place to sleep. Emblem, WY is a booming metropolis – population: 10. It’s probably just one or two families. At one point, we finally saw lights off to the side of the road. Since I wasn’t going that fast to begin with, I was able to pull over. The Elk View Lodge was lit up and had actual cars in the parking lot. (We hadn’t seen other cars in a while.) But, you know, it was 1am and I really didn’t want to pay craploads of money for just a couple hours of sleep. So I parked behind a large pickup/trailer combo and we started to nap. Of course that is the time my body picks to need the restroom. So, up to the lodge we went. It was creepy. The doors were unlocked and we went in. But…no one was around. We used the restroom and then left. We never saw anyone. There wasn’t even a registration desk. Weird. At this point, I was wide awake again. So we kept going. Around 3am, we coasted into Sheridan, WY. Thank goodness we could get a room at the Best Western. By 3:30am, we were both asleep. It was a crazy, crazy, crazy day. It was full of excitement, wonder, and adventure. Great videos and pics! My Dad drove through Yellowstone in the late ’30’s He never stopped talking about it… So glad you all had such a wonderful time. Thanks for sharing your driving adventures and all the gorgeous pictures. I’ve done the bison dance myself and was amazed at how huge they can be. Enjoy the rest of the trip home.